This “brilliant” recipe came to me the other night when I was making dinner and it took barely 25 minutes to make. 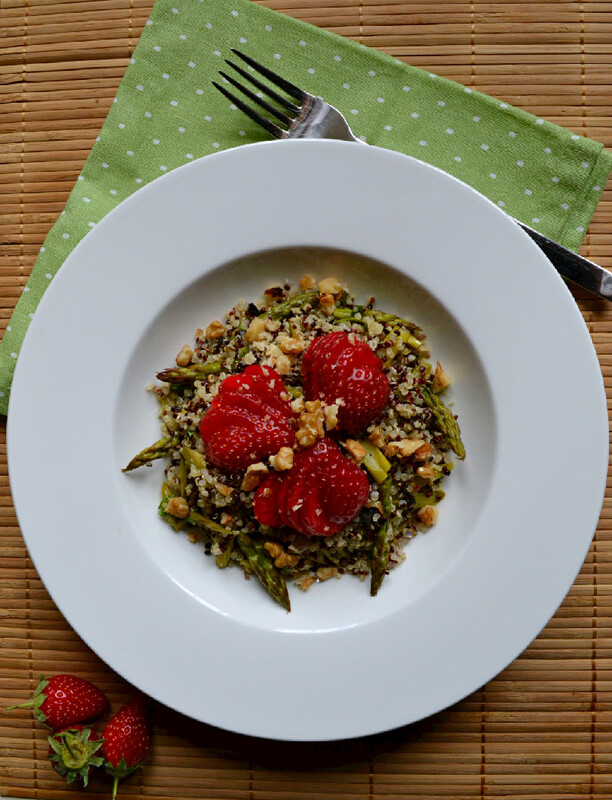 I was so proud of myself and thought I had created something original, until I googled “asparagus, quinoa and strawberries” and I got something to the tune of a gazillion hits from other bloggers and foodie sites who had already posted similar recipes. Who knew asaparagus and strawberries were a thing? I sure didn’t. But let me tell you, now that I’ve uncovered this truth, there’s no stopping me. That and I’ve got hubby eating asparagus now, yet another vegetable he claimed he didn’t like until he was introduced to this recipe. He then ordered this for lunch at a local spot on Saturday. That’s when I knew I had successfully converted him. 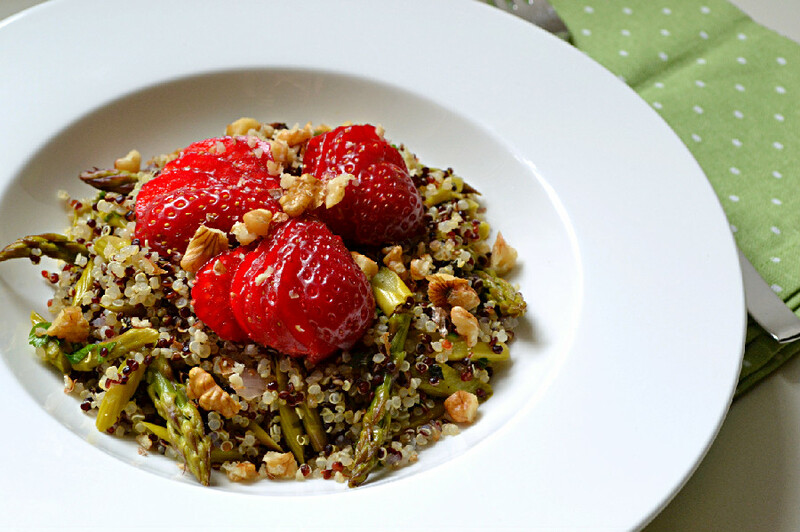 That said, today, I present you my take on the quinoa, asparagus and strawberry salad that can be eaten hot, warm, cold, at room temperature, how ever you like really. It can be eaten right when it’s made, taken to a pot luck or picnic, made ahead and refrigerated for the next day, it’s delicious either way and hubby approved. This dish is well balanced in that it contains all the essential macronutrients; carbohydrates, protein and fat. I’ve spoken about the virtues of quinoa many times, so let me just remind you that this seed, used as a grain, is naturally gluten free, and contains all 9 essential amino acids making it one of the plant world’s complete sources of protein. It’s nutty delicious and loaded with all sorts of good for you vitamins and minerals. Asparagus, a spring jewel, is an excellent source of fiber, vitamin K, folate, selenium and B complex vitamins among other vitamins and minerals. It has many potent health benefits; it’s a natural diuretic, helps regulate kidney function, eliminates toxins from the liver, has powerful antioxidant and anti-inflammatory benefits, and more. The fresh raw strawberries add a good dose vitamin C and freshness and the walnuts add another dimension of crunch and texture with an excellent dose of omega 3 fatty acids. Asparagus are lightly sauteed with shallots and sea salt and deglazed with white balsamic vinegar until tender but still crisp, then tossed with herbamare seasoned black & white quinoa and topped with lemon juice, more white balsamic vinegar, a drizzle of extra virgin olive oil to keep things nice and fluffy, some chopped fresh mint and parsley, chopped walnuts and fresh strawberries. Spring perfection in a bowl with a good dose of protein, fiber and healthy fats and an array of vitamins and minerals to keep you balanced. Soak and rinse quinoa thoroughly with a fine mesh strainer. You can soak the quinoa overnight with an acidic medium like a drop of lemon juice or apple cider vinegar or simply soak it for about 15 minutes before rinsing it and letting it drip dry in a fine mesh strainer. Add quinoa to a dry pot and toast it on medium low heat until all the seeds are dry and slightly puffy. Be careful not to overtoast or burn the quinoa. Add 1 1/14 cup of filtered water, increase heat to medium high and bring to a boil. Add in herbamare or fine sea salt and stir to distribute throughout. Reduce heat to low, cover and simmer about 15 minutes or until all the water has been absorbed and the quinoa is cooked and fluffy. Be careful not to overcook the quinoa or it will turn into a mushy mess. Meanwhile, add a teaspoon of extra virgin olive oil to a wok or deep pan and warm slightly. Add in shallots and sautee on low heat until softened. Add in crushed garlic and sautee an additional minute. Slice the asparagus into small pieces on the diagonal and set aside the tips. Add in the sliced asparagus stems to the shallots and garlic and sautee for a minute. Deglaze with 1 tablespoon of the white balsamic vinegar and add in the tips as they will cook faster than the stems. Remove from heat when the asparagus is tender but still crisp. Toss cooked quinoa with asparagus mixture, add the juice of half a lemon, additional tablespoon of white balsamic vinegar, additional teaspoon of extra virgin olive oil, chopped fresh herbs and toss to mix well. Transfer the salad to servings bowls or dishes. Top with sliced strawberries and chopped walnuts and serve immediately. Otherwise, you can refrigerate the salad and serve it cold. Do not add the strawberries until you are ready to serve the salad. P.s. Those strawbs are the cutest! Thanks Audrey. My first thought was maybe I shouldn’t post it…then I thought, well it’s clear that it’s a winning flavour combo if so many made it…then I thought….hey this is amazing and I don’t care if others made it too…this one’s mine and it’s darn delicious…lol.